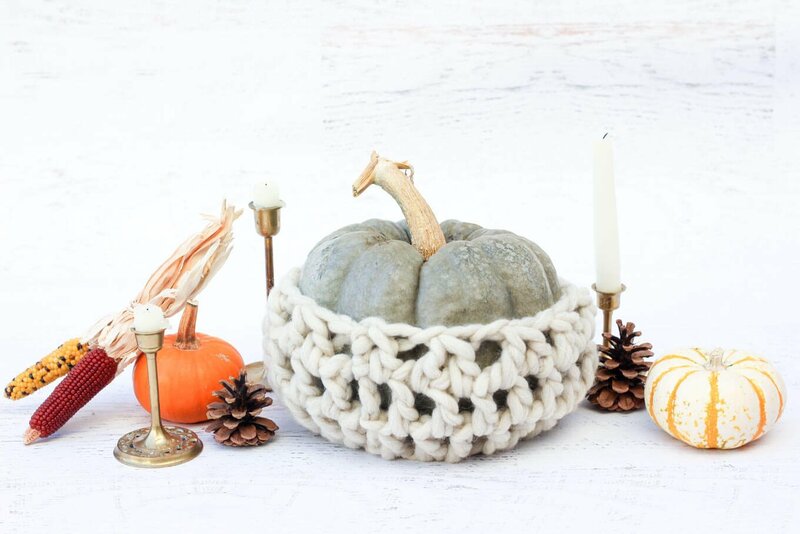 Add a wool-wrapped pumpkin to your Thanksgiving tablescape with this easy fall crochet pattern! What you’re favorite thing on the table at Thanksgiving? Perfectly glazed turkey? Cranberry sauce? Mashed potatoes and gravy? You’ve probably already picked up on the fact that I love to combine DIY materials to create unexpected results (hello, crocheted flip flop slippers, popsicle stick hexagon shelves and coffee stirrer wall art), so when I saw this incredible L.B. 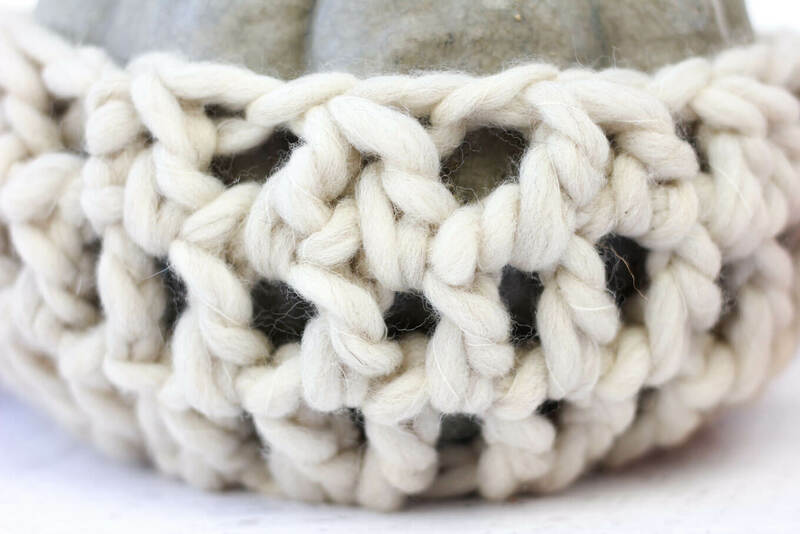 Collection Natural Wool from Lion Brand, I knew that it needed to become part of my fall decor. The thing is, I’m really trying to get better at making simple projects that I can just whip up and start enjoying their presence in my life. 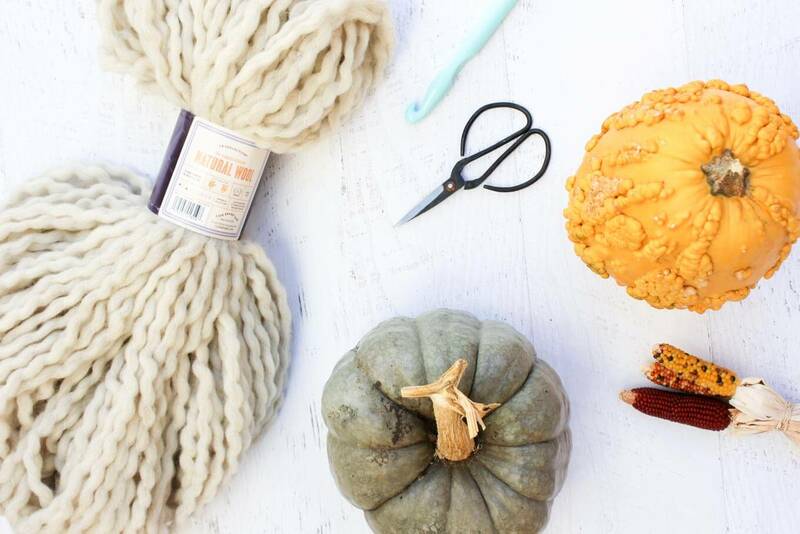 Don’t get me wrong, there’s definitely a time and a place for epic projects like my beekeeper’s quilt, but there’s apparently also a place for pumpkins in wool jackets. And that place is right in the middle of my dining room table. 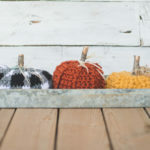 This fall crochet pattern can be used to wrap any sized pumpkin. 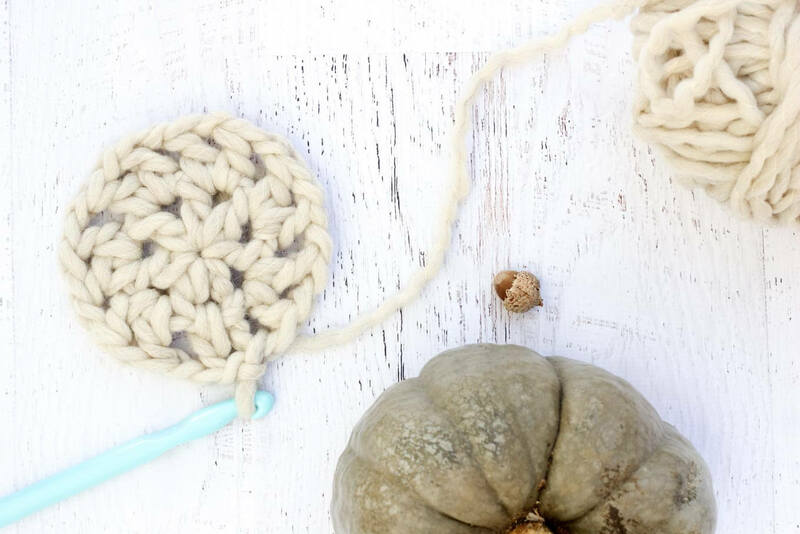 I just essentially crocheted a circle until it was about the same diameter of my pumpkin. Then I worked one round without increasing at all and finished up with one round where I decreased quite significantly, creating a “waistband” to hold the cozy up. 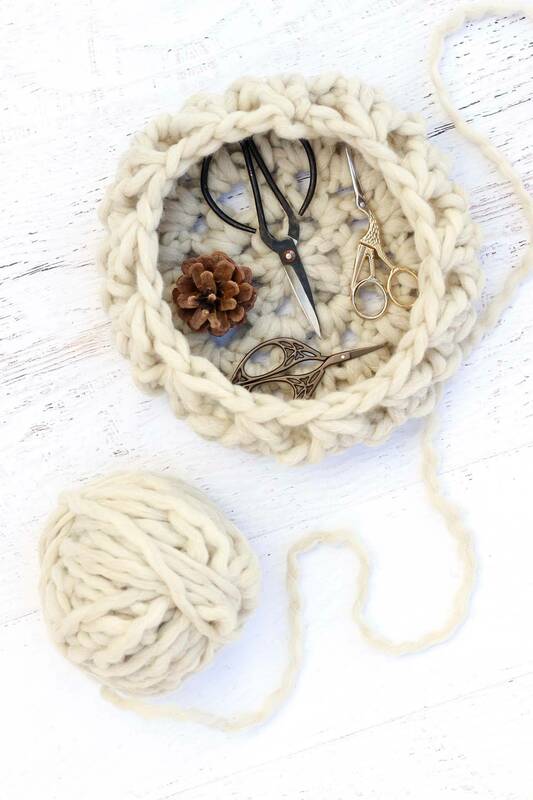 When Thanksgiving is over, I look forward to using this chunky wool basket to hold my ever-growing scissor collection. Use the following pattern as a rough guide, but there’s so much room for you to add your own personal touch on this one. 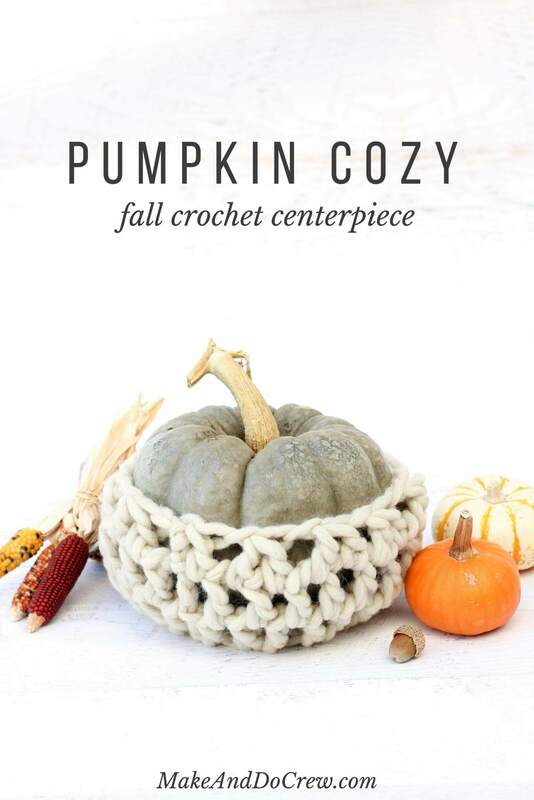 You could make a cozy that covers the entire pumpkin. 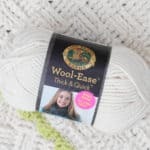 Or experiment with different weights of yarn or combining two strands. There are so many different looks that can be achieved using this general concept. 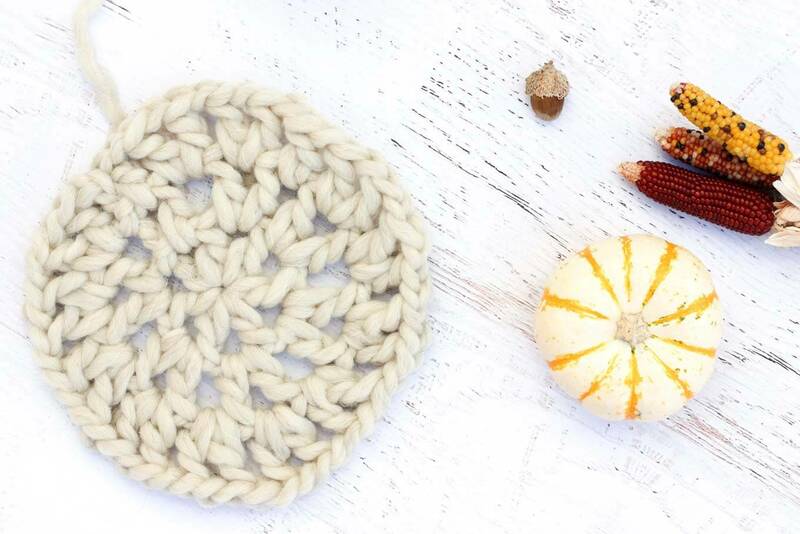 You can make this fall crochet pattern in less than a half hour, so you can literally whip it out while the turkey’s in the oven. Just kidding! Make it a few days ahead of time so you can enjoy it for as long as possible! I love to see what you make! 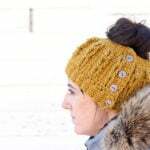 Tag me on Instagram (@makeanddocrew and #makeanddocrew) to show off your stitches! 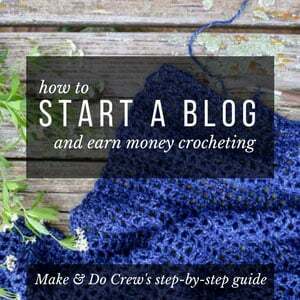 So you can spend more time crocheting and less time shopping, this post contains affiliate links. To begin, ch 6 and sl st into first ch to join to form a ring. Round 1: Ch 4 (counts as 1 dc and ch 1), [dc in ring, ch 1] 6 times, sl st into third ch to join. Round 2: Ch 4 (counts as 1 dc and ch 1), *[dc, ch 1, dc, ch 1] in ch-1 sp, repeat from * 5 times, dc in last ch 1 sp, ch 1, sl st into third ch to join. Round 4: Ch 4 (counts as 1 dc and ch 1), [1 dc in next sp, ch 1] repeat around, sl st into third ch to join. Repeat Round 4 more times for a taller/larger pumpkin cozy. Round 5 (Decreasing Round): Ch 3, [dc2tog over next 2 ch-1 sps, ch 1] repeat around until 1 ch-1 sp remains, insert hook in last ch-1 sp, yo and pull through, sl st into third ch at beginning of round, yo and pull yarn through all three loops on your hook. 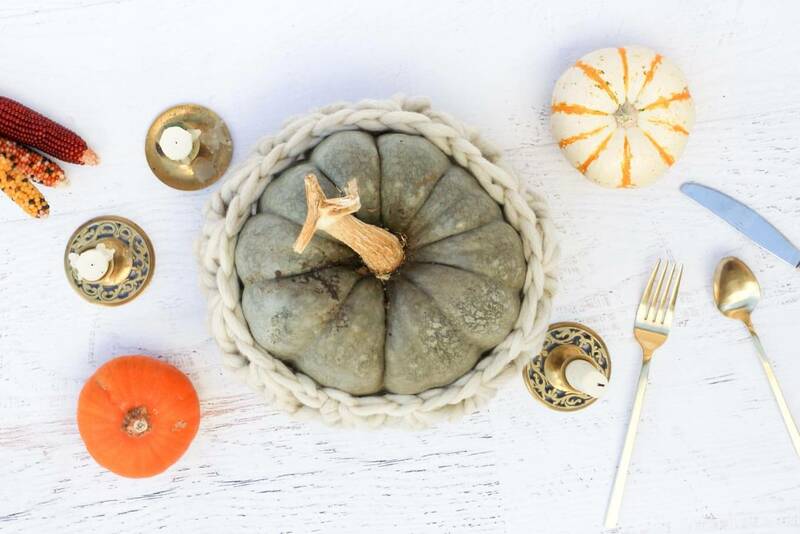 Slip your pumpkin into his new sweater and set him proudly on your Thanksgiving table! 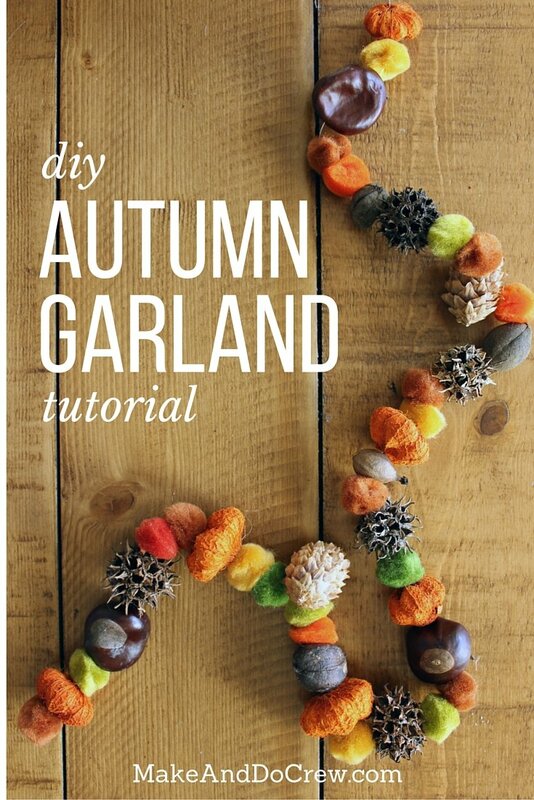 And while you’re in the mood for some fall colors and beautiful textures, here’s a simple, inexpensive DIY garland that is perfect for Thanksgiving.